Having watched a stunning sunset when I first laid eyes on Uluru, followed by a superb sunrise viewed from the south side; experienced my first up-close encounter on the Kuniya Walk (where I discovered there are waterholes at Uluru), we made our way back around to the north side where we joined an Uluru Park Ranger taking a (free) guided walk along the Mala track to Kantju Gorge. The Mala path is rich in traditional cultural sites, including a select few areas where no photography is permitted. The reason for this is that where rock details and features are equivalent to a sacred scripture describing culturally important information, they must be viewed only in their original location – It being inappropriate for their images to be viewed anywhere else other than at that site. 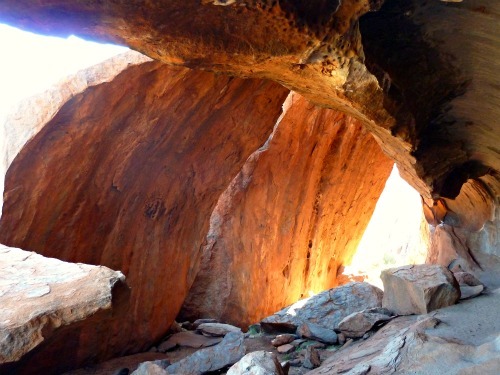 The walk passes overhangs and cave like rock formations that offered shelter to the Mala people, ancestors to the Anangu (prounounced arn-ung-oo) people, traditional owners of the area. The Ranger had examples with her of a piti (wooden gathering bowl) and a manguri (head ring) for balancing and carrying the bowl on one’s head. 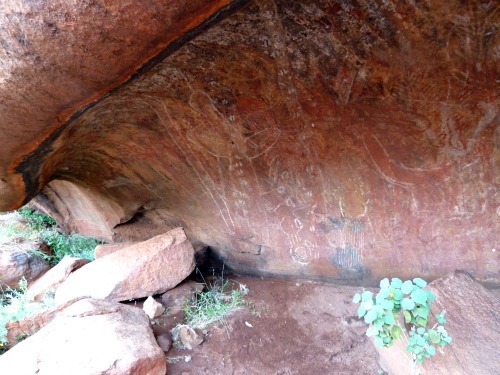 She described the Mala people’s cultural way of life, how they made tools with malu pulku (kangaroo sinew) and kiti (spinifex resin), and she explained the rock art imagery represented on the cave walls. 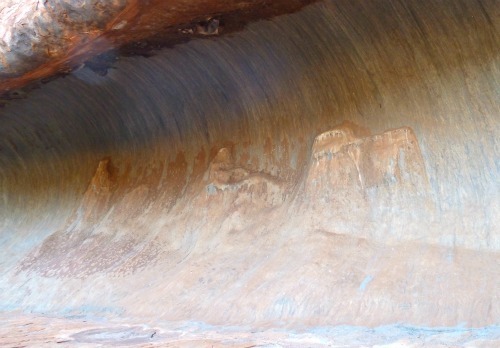 Close to the ground of this cave wall one can see a circle with concentric rings. 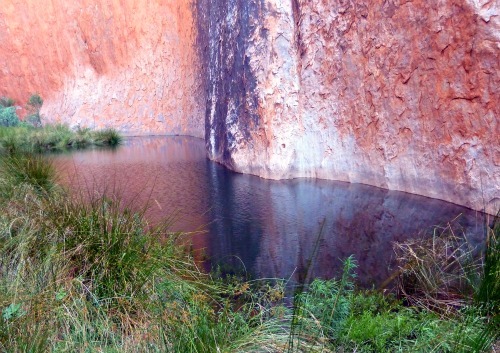 This represents a permanent water site (Uluru). The circle above it with no inner circles is an area of no permanent water supply and in this case represents Kata Tjuta. Whilst when we visited Kata Tjuta (later in the day) there was water present, it is not a supply that can be relied upon during drought. Members of the Mala community performed their respective tasks in groups defined by gender and age. We saw a cave where the ceiling was blackened by soot from endless years of camp fires tended by the elders. Areas where the young girls were taught and areas where the young men were initiated. We saw the Kitchen Cave where minymas (women), kungkas (girls) and small children would have camped. Here you could see rocks smoothed from grinding seeds into a flour, which when mixed with water and cooked on hot coals produced a nyuma (flat bread). In the senior Mala men’s cave they camped and preparerd for inma (ceremony). “In the middle of preparations. Two Wintalka men from the west approached and invited the Mala people to join their inma in their country. The Mala people said no, explaining their ceremony had begun and could not be stopped. The disappointed Wintalka men went back and told their people. They summoned up an evil spirit, a huge devil-dog called Kurpany, to destroy the Mala inma. 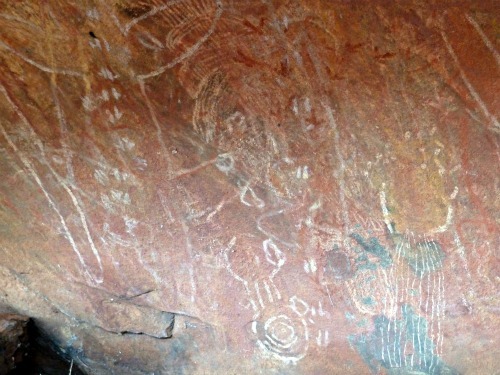 As Kurpany travelled towards Uluru he changed into many forms, from mikara (bark), to tjulpu (bird) and different grasses. He was a mamu ghost. 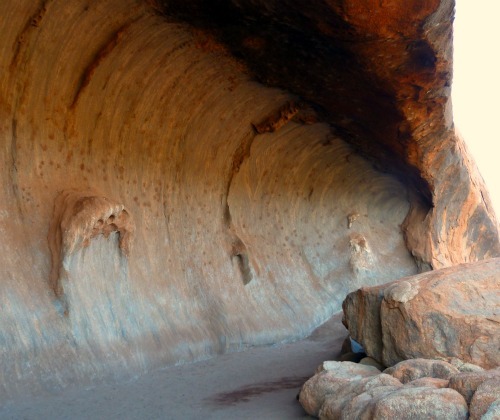 The faces of those men can still be seen with their white hair and beards on the back wall of this cave ~ The Mala story is set in stone here. 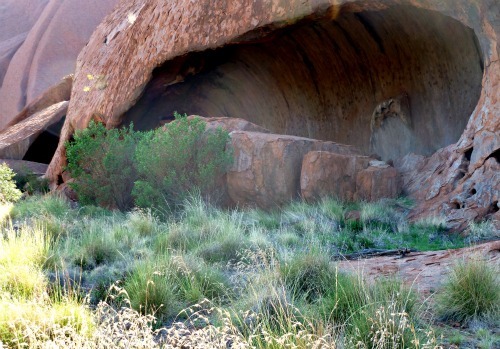 The Anangu people have successfully hunted and gathered in this land for generations passing down their stories and celebrating their ceremonies. 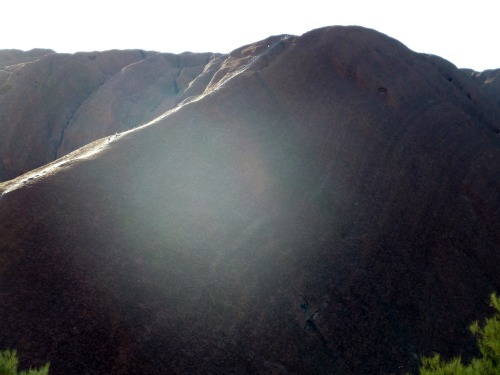 The route of the climb on Uluru is associated with important Mala ceremonies. Aboriginal belief is that during the creation period of Tjukurpa (pronounced: chook-orr-pa) Mala men took that route when they arrived at Uluru, so it is a traditional route of spiritual significance. Through education the hope is all will understand and respect their law and culture by not climbing. But only one photo of Uluru came out black ~ The Climb. is there a need to trample on it? Uluru was initially inscribed on the World Heritage List in 1987 for its outstanding universal natural values, but its outstanding cultural values were added in 1994. 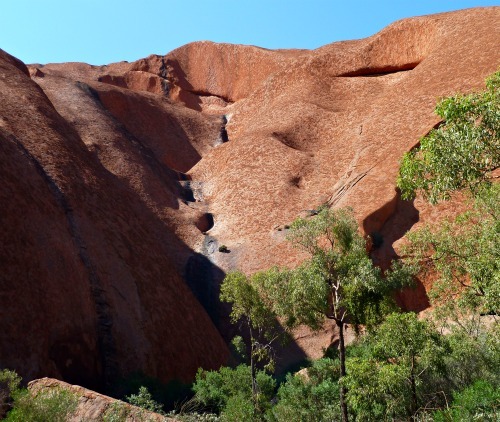 Uluru’s red colour comes from the iron minerals in the rock, which when weathered by water and oxygen, rusts like iron. Uluru is made from a sedimentary rock called arkose sandstone, its apparent soft folds having been smoothed by wind and rain over aeons. …from soft folds and crevices, to sheer brazen walls. Have you been? Or is that trip still on the ‘bucket list’? 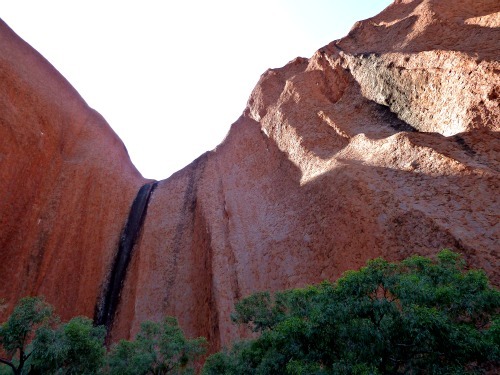 This entry was posted in Australia - The Red Centre and tagged ayers_rock, central_australia, kantju_gorge, mala_walk, northern_territory, red_centre, uluru by Linda. Bookmark the permalink. July – August will be a lovely time of year, cold at night but perfect for walking and exploring during the day. We loved getting up close to Uluru by walking around it too. 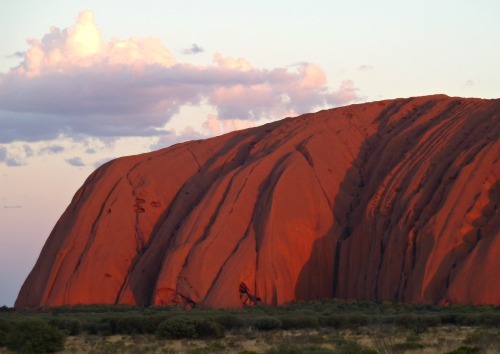 I can’t understand people who climb it when the aboriginal people are so against it. I actually don’t know why it’s even allowed. So it will become history in time. I chose not to climb for two reasons! The steepness of the track gave me the screaming jitters – which made it VERY easy to respect the Indigenous people’s wishes. Although both played a part, I wonder what I’d have done if I WASN’T a serial-vertigo-sufferer?! Red Nomad OZ recently posted..Giveaway #1 – Journey Jottings Product Pack! That “free” guided walk looks like a bargain. I have to include it when I go there. I have no plans yet, but it is going to happen. What a stunning spot and I have enjoyed seeing it from another angle. I look forward to seeing it for myself. 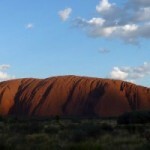 We are looking forward to visiting Uluru during our next visit to Australia in 2012. The guided walk looks like time well spent. Wonderful photos, Linda … well done! 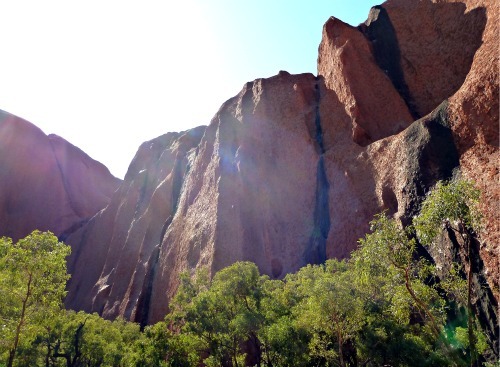 Have you been to Uluru before? loved your blog – taking my son there for his 18th birthday in Feb.
we have 4 full days and never even considered climbing. i think your black photo says it all! i’m horrified to hear that anyone would ‘toilet’ in such a sacred place – hope they get a nasty sunburn. i guess it will be really hot, but how cold does it get overnight? a cardi or a jacket? Also can u recommend a place to feed a ‘growing boy’ for a fair price? i’ve heard food is outrageously pricey. In February it’ll stay fairly warm even at night too – only down to about 20C average, although funnily that can feel ‘cool’ if its been 37C during the day! Early morning light/atmosphere is always so magical too! Heat wise, the Cultural Centre, which is out in the Park, is open 7am to 6pm and is full of fascinating information as well as being a cool retreat when the sun gets high! There is an IGA supermarket at Yulara, which depending on where you’re staying you could self cater breakfasts, lunches and fill up snacks in between! General food prices there were fairly equitable. Hi Linda, What a stunning website! I visited Uluru in 1988, makes me feel quite old thinking about it! I was 15 and climbed to the top in 21 minutes. Our guide had tricked me, telling me there was a Coke machine at the top! Thanks for the compliment on the website, and for dropping by! 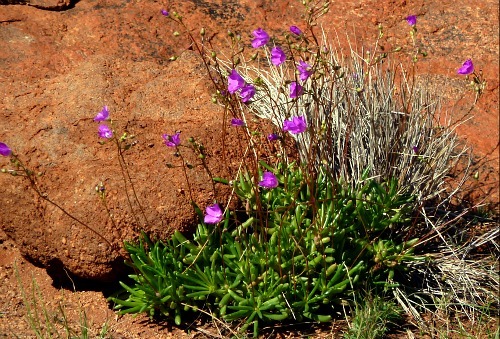 The emphasise these days (24 years after 1988 😉 ) is for visitors to Uluru to gain familiarization with the indigenous culture of the region whilst enjoying the diversity of flora, fauna and landscape all at ground level! I’ve been guiding here for many many years, taking backpackers and tourists from many parts of the world here and teaching them all there is to know about this absolute wonder of the Earth. In over 1000 guided tours to this area, i’ve always illustrated the cons about climbing the Rock, having seen a good few deaths from people falling. 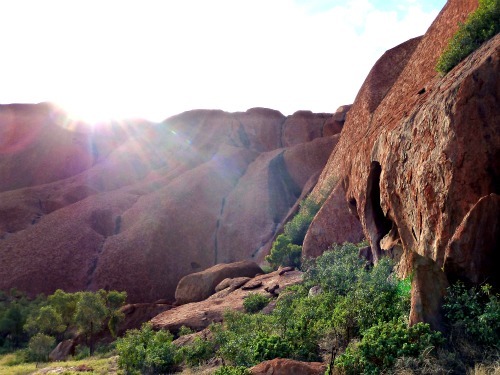 As well as the cultural significance to climbing i also believe the ecological significance is far greater, everything that goes up the rock must come down, and i’ve seen nappies, ciggerette butts and all kinds of rubbish come from the top to land in Kantju or Mutitjulu waterholes. If the water was to be contaminated, game(kangaroo’s and emu) and other things wouldn’t come to the water to feed, therefore reducing the supply of food for Mala/Anangu people. I’ve also noticed you tell a revised version of the Mala story, which really, should be told at the base of the rock where you can hear it where it happened, this is a big long story and a fraction of it takes place at the rock, the ret of it, young men have to go ‘walkabout’ to gather the information and relay it back to elders, and really shouldn’t be told on a website or forum. Your website would be a lot more complete if you made reference to the geological happenings of both Uluru and Kata Tjuta, from the splitting of continents, the Petermann Orogeny, it’s erosion and alluvial fan pattern to fill the western side of the Artesian basin, and subsequent erosion since it’s estimated arrival on the surface of earth some 350mya, to what we see today. The stories of European settlers withing the area is also a fascinating story to be told and hear. Born in Alice Springs who has worked a photographer and guide here for over 15 years, fluent in Pitjantjatjara, Aranda and Luritja i’d be more than happy to help with other aspects of your webpage if need be, contribute images, wet, dry, waterfalls, wildflowers, dust storms, flooding, sunsets, moonscapes etc, but all round a very nice webpage, lovely images and a good summary of a very very special place. Palya! Thanks for your detailed comment – wonderful to get the full story from someone who has worked and lived in the area Bob. My husband & I visited Uluru in June 2015 & it was the dream of a lifetime for me. I would love to go back to spend more time there. I enjoyed your blog post. Uluru is a remarkable place – I have yet to hear from anyone who has not been awe inspired – which can’t be said for many places! Did you also walk the Valley of the Winds at Kata Tjuta? We did not, unfortunately. My only regret about our trip was that we didn’t spend more time in Yulara. BTW, we are from New Orleans, LA, USA. I wonder the fact you found my site whether you also used one of my Map Journals for recording your trip? I did not. 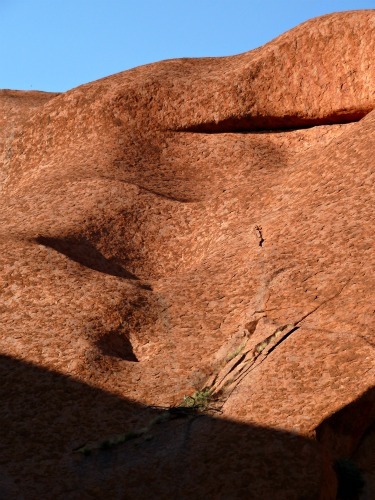 Every now & then I search for an image of The Mala man on Uluru where no photos are to be taken. I just wanted to see it again so bad. I had never found one until a couple of days ago. I didn’t copy it, because that’s some bad mojo right there. That search led me to your blog. My hand drawn pictorial Map Journals are a great way to summarize your trip either during or after you get home all on a singe A2 sized sheet! For interest – here’s a link!! I am from Scotland but on a three month visit to Aus last year I just HAD to visit the famous Ularu! I joined a 3 night tour of ‘the rock’ and am so glad I did. We learned all about the culture, Tjurkurpa, traditions, stories, and symbols connected t the rock and the Mala and Anangu people. Sleeping under the stars each night out in the bush was amazing! We spent many an evening howling with the dingos! I think my favourite site that we visited was Kata Tjuta….I felt an overwhelming sense of spirituality there, more than at Ularu itself. Please don’t leave it out!! Did you have time to do the Valley of the Winds Walk – Being in among those domes and to then feel the desert wind on the far side – Quite superb! Thank you so much for your guidance & tips! Hi Jennifer, How wonderful that you got back to Australia and even more fantastic that you got to spend the better part of a week at Uluru! 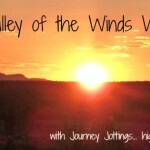 I loved Kata Tjuta too – I wrote this post about the Valley of the Winds Walk that I simply loved!